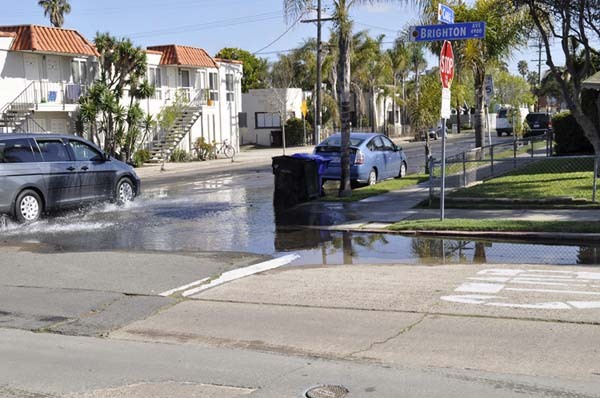 I stopped in Ocean Beach to check the waves at 9:30am this morning while on the way to a tour at the Point Loma Wastewater Treatment Plant and came across what appeared to be a water main leak at the corner of Cable and Brighton. I called the Water Department and reported it, but when I called back a few hours later to find out what happened, they told me they assumed someone was already working on it because of a wastewater problem that was being repaired about a half-mile away, also on Cable. I don’t know what the outcome was, but here’s what it looked like when I was there. The water was bubbling out of the asphalt, between the trash can and the car driving through the pool. I couldn’t see if there was a manhole cover there. By the way…the waves were pretty good at the north jetty. This entry was posted on April 6, 2010 at 5:01 pm	and is filed under Water. Tagged: Ocean Beach. You can follow any responses to this entry through the RSS 2.0 feed. You can leave a response, or trackback from your own site. The San Diego Water Department told me they do “preventive maintenance” on the valves every five years.